CK and Nate header: Lights, Beams, Ceiling! Remember way back when I asked you all which light you would choose? Well, you all picked the second light and honestly, based on these pics alone, I would pick that one too... if I had $800 to spend on lighting in the kitchen. 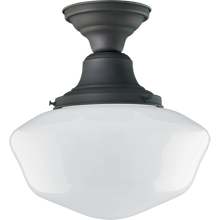 On the other hand, I could totally afford the top light at $19.99 for small and $29.99 for a medium and the things I didn't like about the pic comparison (the more yellowish shade and brownish fixture) were not really characteristic of the actual light. In reality, the shades are a bright white and even with the lights on, don't look yellow and the bases are much darker than the pic. We ended up getting four small lights and one medium light which cost less than one of the high end ones and once installed, look awesome in my opinion. We decided to use lights instead of pot lights because in our last house, despite many pot lights, it still felt dark in the kitchen. With these lights, the light is thrown in all directions instead of straight down and it is BRIGHT in our kitchen now which is awesome. We went back and forth on what we wanted to do with the ceiling in the kitchen. I was 100% against ripping down the ceiling to install the vent hood and all the electrical for the new lights and since we have such high ceilings, it seemed like a great time to add some architectural detail. 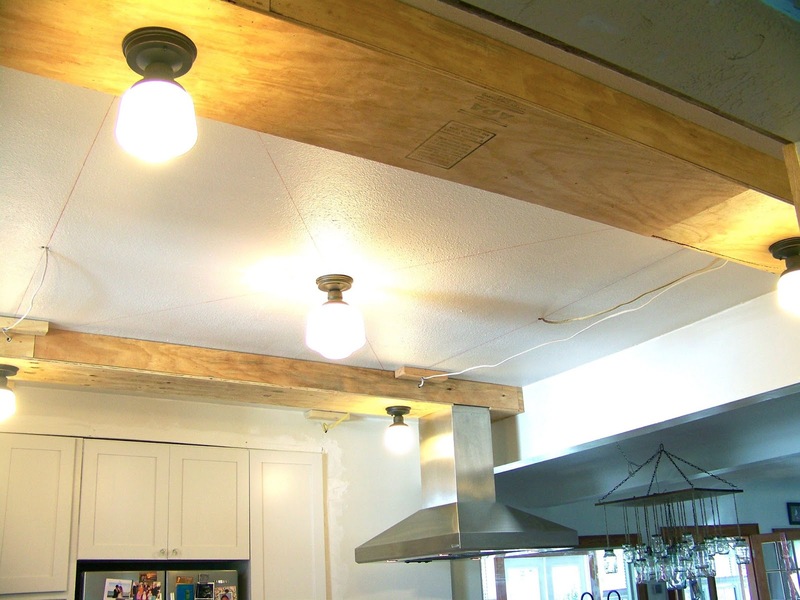 That's where the idea of beams came in to play. 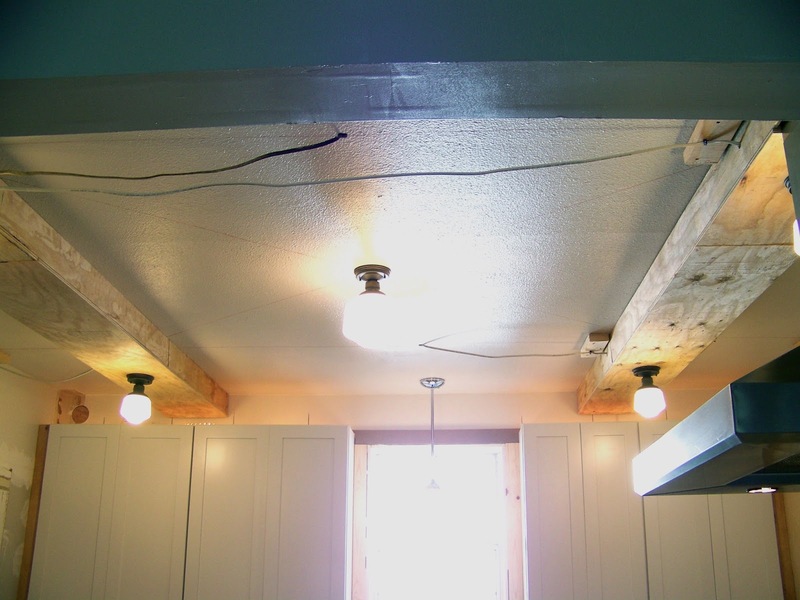 So far, we've installed the longest sections of the beams since those are where the lights are installed, but we will also have beams running in the opposite directions (you can kind of see the chalk lines on the ceiling) to create basically a hashtag symbol on the ceiling. 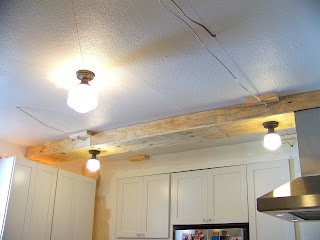 This allowed us to run all the electrical in the beams and create some drama in the kitchen. Of course the beams look rough right now. 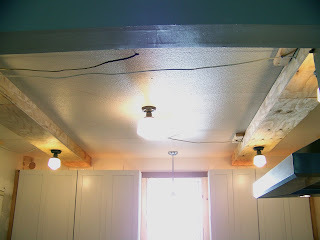 They will eventually get all trimmed out and painted but right now we are loving the fact that we once again have light in the kitchen.